When Winslow walked out of the jail, he nodded to a photographer who was waiting at the top of the steps but did not say anything about the charges. This Nov. 24, 2013, file photo shows New York Jets tight end Kellen Winslow during a game against the Baltimore Ravens in Baltimore. 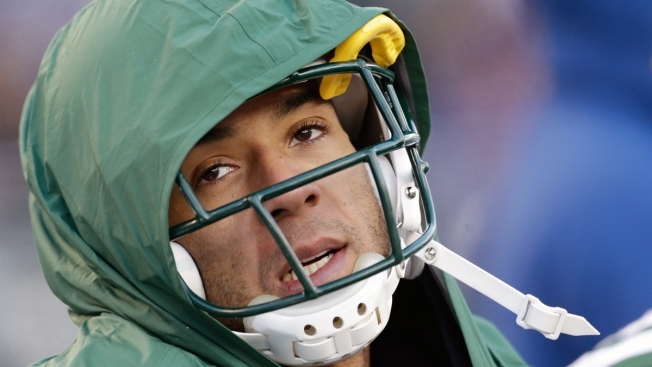 Former NFL player Kellen Winslow Jr., the son of a Chargers Hall of Famer, was arrested Thursday in connection with a Southern California burglary. Winslow, 34, was arrested just after 2:30 p.m. after deputies responded to reports of a possible burglary in Park Encinitas, north of San Diego, authorities said. The person who reported the burglary tried confronting the man — later identified as Winslow — because he did not recognize him. Investigators say Winslow then tried to drive off in his SUV but was tracked down by San Diego County Sheriff’s deputies and arrested. He was charged with one felony count of first-degree burglary. Winslow spent five hours in a north San Diego County jail before posting bail. When he walked out of the jail, he nodded to a photographer who was waiting at the top of the steps but did not say anything about the charges. It wasn't immediately clear if he had an attorney who could answer to the charges. Winslow has a court appearance scheduled for Monday. Winslow grew up in San Diego and graduated from Scripps Ranch High School before playing his college football at the University of Miami. His NFL career started with the Cleveland Browns in 2004 and included stints with the Tampa Bay Buccaneers, Seattle Seahawks, New England Patriots and New York Jets. Anyone with information regarding the incident is asked to call the Sheriff's department at (888) 580-8477.